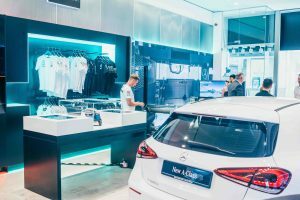 The St David’s Partnership, owners of St David’s in Cardiff, one of the UK’s premier retail and leisure destinations, has announced that global luxury automobile brand, Mercedes-Benz, has returned to launch a new pop-up store until August 16. The international brand has taken a 2,419 sq ft unit for the Summer displaying a selection of the brands latest models. The Mercedes-Benz pop-up gives St David’s visitors the opportunity to experience and discover the product and new features available. Retail brand consultancy, Green Room worked with Mercedes-Benz to design the pop-up store at St David’s. Speaking on behalf of the St David’s Partnership, a joint venture between Landsec and intu, Colin Flinn, regional managing director – west, commented on the opening: “Welcoming Mercedes-Benz back to St David’s this summer is a great opportunity to offer an exciting experience-led brand to our visitors. 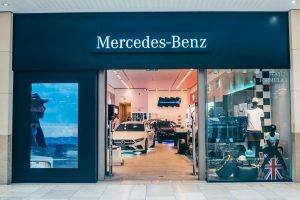 The Mercedes-Benz pop-up follows other popular car manufacturers showcasing at St David’s including, celebrated British car brand, MG Motors, and its first retail boutique experience outside London last year. The St David’s Partnership and Mercedes-Benz both dealt direct.